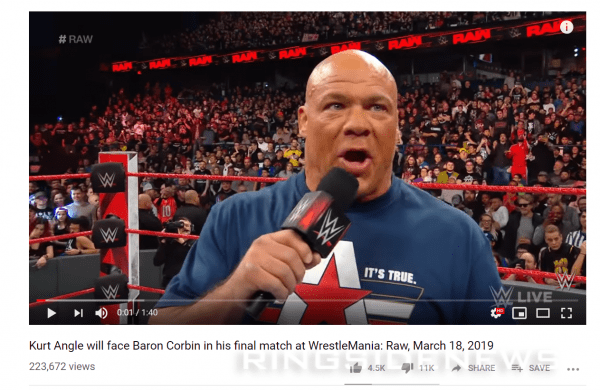 Kurt Angle came out on RAW this week and announced that his WrestleMania opponent will be Baron Corbin. This did not set too well with fans in Chicago and the internet has stepped up to agree in a big way. Angle’s wife has since kayfabe commented on this decision and Matt Riddle is pretty sad about it as well. When WWE uploaded the video on YouTube of Kurt Angle’s announcement it was not received very well at all. The video from WWE’s YouTube gained over 223,000 views over night and 4.5k people liked it. However, that is nothing compared to the 11k people who gave it a big thumbs down. This is a pretty dramatic difference in opinion. WWE has their reasons for booking Baron Corbin, but the fans are apparently not having it. We will have to wait and see if WWE might change things up to appease the WWE Universe, but for now. it looks like Kurt Angle vs Baron Corbin is a lock for WrestleMania 35.